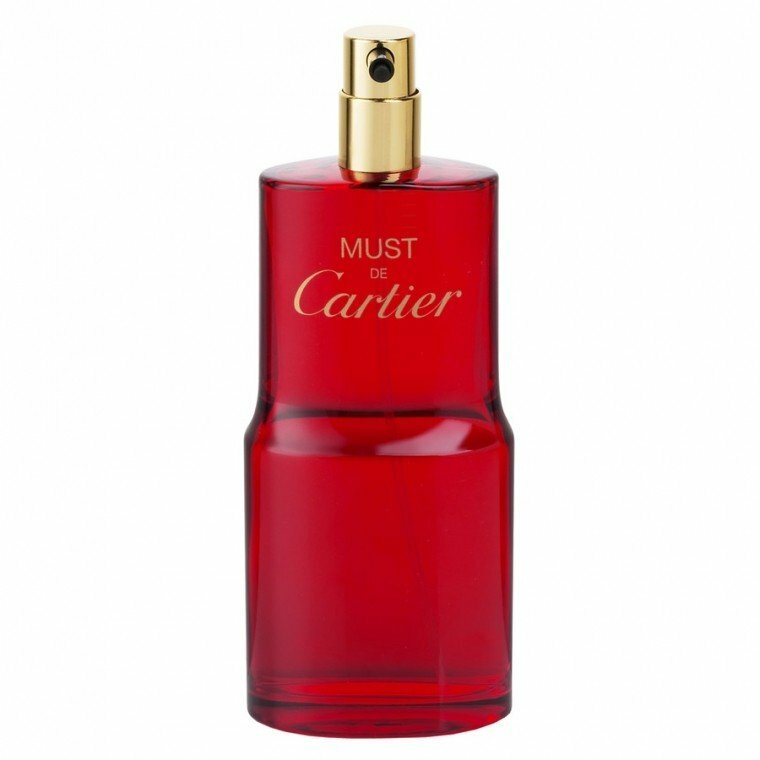 Must de Cartier (Eau de Toilette) is a popular perfume by Cartier for women and was released in 1981. The scent is oriental-spicy. The longevity is above-average. It is still in production. This fragrance is a piece of my memories of child. I remember that it was my mother's scent in wintertime and she sprayed it mainly when she wore her mink coat, status symbol of the glorious Eighties. I was too Young and my nose didin't like so much this fragrance so opulent and warm-spicy...but time goes by, tastes changes and after many years I would smell again this scent I've found on my favourite drugstore's shelves . The result? love at first smell. I immediately knew the reason of its name: this scent is a MUST and you cannot stop smelling it after you've sprayed it on the mouillette and on the skin too! The first notes are soft and fruity: mandarin and a neroli not too bitter but very round and feminine. The Galbanum touch is noticeable and gives a stronger character to the opening accord. Then, at athe heart, a true garden of delights: rose, vibrant Jasmine and rose. The quintessence of feminity and sensuality. Finally, an almost "masculine" musk-vetiver base madre warmer, sweeter and rounder by a wonderful vanilla touch. It's a perfect symphony staying on your skin for hours and hours even in this edt version, with a very satisfactory and charming sillage. I'd recommend to wear this edt by day with a fur or in the mid season by night too. Extremely refined in its simplicity the bottle recalling the oval shape, one of symbols of the Maison Cartier. The price is high but not impossible (Chanel's,Tom Ford's and Eisenberg's creations are more expensive!) 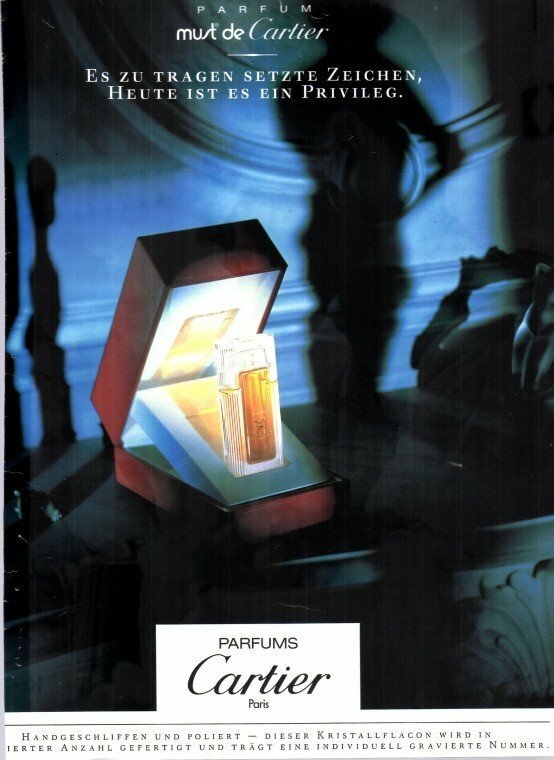 for this myth of the Eighties that to me remains an evergreen in the contemporary perfumery. I love it and wearing it could be like felling my mother 's scented hug. ...how long it's been since I've even noticed Must de Cartier.? It is a revelation to explain how different and special this fluid works in my nose. Detlef was a popper, and liked Depeche Mode and other pop bands at the time. A cool guy who was soft somewhere. My girlfriend Moni (who I have known for 35 years) always played the violin. Always loud, always in a hurry and always up to date. At that time we were 14 years old and full of the desire to experience. - and we were out with Detlef a lot. We didn't know anything that was too dangerous for us to get into our favorite disco. Some of us hitchhiked about 45 km. Once there was also a Turkish bull with us; with Mustafa and Fatmah; they took us with them. They were the most humane in the country, because there was no one else who drove long. So you were our salvation!!! Yeahhh! You don't smell it in places where you sprayed it on, but it envelops you like a silk cape and it surpasses your most foolhardy thoughts. It becomes your own aura, so to speak. Must really is a must because you can't vote it out once you've sprayed it on. He sticks and stays with you... Deep, deep, animal earth. I had some respect for him, because I've never had a Cartier before... i've always dismissed watches and jewelry in general, but never knew what beautiful fragrances Cartier created. How special every single minute can smell if you consciously use your nose. I can say a lot about the fragrance, but the most important thing I think is the feeling of having arrived home and a hunt that took years, where you compared and tried and yet nothing was good enough for you... Yesterday when I intoxicated myself with this fragrance, I felt how body-hugging and lovable this fragrance is. So Cartier doesn't stand for cold stones and show, but has a very special way to enchant. I'm flying high right now and you're all in! Thanks to the condition that I liked to sniff at a Cartier from the 90s, I also thank Detlef, who gave me this memory. We lived our time in the disco and we slept during the day - while we danced at night - and smelled good. And I like to smell good today just like I used to. The best thing is to go to bed with a scent that envelops your memories and your future. I've known MdC since the '80s. At that time I took this fragrance for granted. In a world of Kouros, Eau Sauvage Extreme, a decade that wanted to be just that: extreme! Only Bowie weakened in those days and left a mainstream cloud behind, which probably celebrated the masses as a hit (Chinagirl e.g. ), but the fans as a tear. You could buy Jean Louis Scherrer for 29,95 DM, it was a better Ellen Betrix perfume and Guhl Harrshampoo was still available in the small glass bottles with the ingenious peach scent. But Must de Cartier was in Olympus. Not so much because of the price - although 100 DM was already a house number at that time - more of its noble presentation and packaging and of course because of its scent with its beguiling heaviness...there was nothing comparable point. I was able to save a pitiful remnant into modern times and the bottle bobbed a shadowy existence in the truest sense of the word next to the original Vintage Dioressence...until - yes, until a coincidence - some call it cleaning up in old boxes - brought the bottle back to the surface. I closed my eyes and there it was again, that magic, that hunch of a paradise that had to lie on this side. In short, I wanted it. 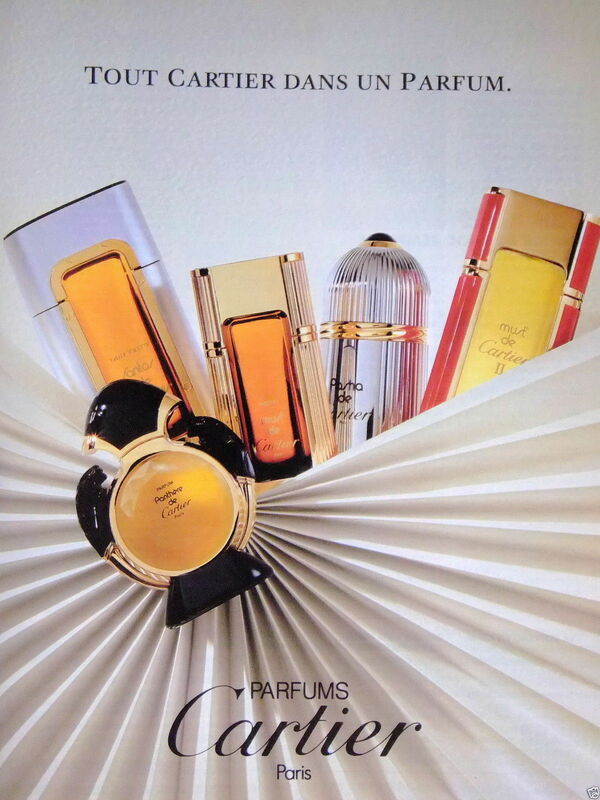 When I rushed to the perfumery, I was struck by the blow...THE CONNECTION OF NOT BEING CARTIER'S SERIOUS...the copy of something that was once perfect is even worse than a cheap Rossmann fragrance, which doesn't necessarily have to be bad, by the way. Then you'd better stamp it and reminisce! For some time, about 8 years back, I tried, and then dismissed Must for being too easy, as I did with a couple of other big perfumes (L'Heure Bleu par example..., which is now a favourite) : I was still on a long term quest for 'something really special' to replace Opium. It is sweet, but it is with leather and a fine citrus! It is sweet, but it is heavy! Orange fluid rules and so do the late seventies! I'm disappointed with the (current) EDT because the dry down doesn't have enough sillage. It smells watered down. Also I smell very little amber. I have to apply 6 or 7 sprays (drenched) to get acceptable sillage. It's mostly a nice vanilla scent. 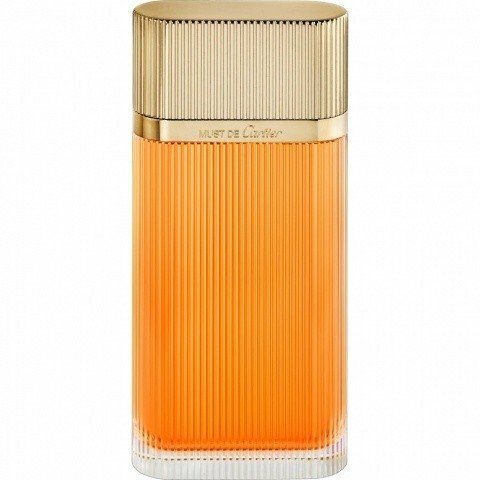 Having said that, and considering the low price I paid at a (reliable) online discounter, Must de Cartier EDT still has quite a lot of interesting notes: Short-lasting amber nicely combined with galbanum, warm spices, a very small amount of carnation, a nice vanilla that seems woody, and in the end vanilla plus some patchouli. I find it interesting but not satisfying. Be aware of what you're buying. You MUST let this scent perform its magic without, necessarily , following the pyramid of notes. You MUST listen to it calling you to enter other dimensions of the world. It is spring and winter at the same time. It is dew and dust. It is rock crystal and opac onyx. All in one . A dusty rose transports you in an italian palazzo and its vaulted ceilings. Inhale the aroma of mandarines piled on the corner table and open the windows to let the warmth of the last autumn days welcome you. Who said it was autumn? It is summer and the deep scent of flowers is the proof. What a beautiful summer morning! Who said it is a summer morning? You MUST be dreamming! It is a cold winter day, the windows are covered in mystical drawings . I am in Denmark , in Andersen's fairy world and feel like the little girl who was creating her dream places at the spark of a match stick. One MUST keep the dream alive. Reviewing the parfum and the EDT, both bottles from the mid 80s and late 90s. The parfum and EDT are two very different animals. 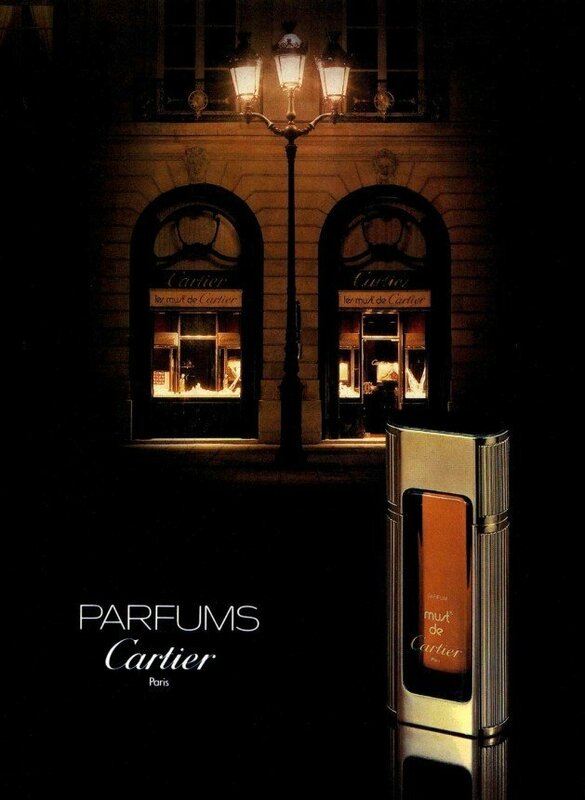 The parfum was created first, marketed as an evening scent, so Cartier eventually decided to create an EDT and call it "Must de Jour". Where the parfum is opaque and narcotic, the EDT is gentle warmth and golden light. Both are unparalelled stunners, each in its own way, and both have their place in any life situation. The parfum is a take no prisoners ambery-vanillic oriental, which chooses pineapple and labdanum as its chief top notes, while the EDT is a more subtle, but no less impactful floral-oriental with bergamot and mandarin as its main citrus notes. One is dense and slow moving, building up to a crescendo of dark, mystery laden notes, underscored by a superb sandalwood accord, whispering on the skin with a smoky-vanillic fugue created with the addition of galbanum. Along with the civet, this helps give the scent a subtle leathery edge, just enough to impart a deeply sensual and lingering touch. The other is almost mouthwatering, glowing and definitely more sheer, with an emphasis on gentle citrus to tie in with the floral notes, and a gorgeous neroli filigree throughout. Less vanilla than the parfum, it relies on amber, musk and vetiver to complete the impression of veil like transparency: If it were a fabric, this would be a silk backed burnt out velvet, fluid and luxurious, in deep copper tones. Both are profoundly expressive scents, but I find the EDT far more versatile: I love the parfum, but I have to really be in the mood to match its intensity, whereas the EDT seems more agreeable for a broader variety of occasions. Fantastically good!!! I tried this many times in the 80's and thought "peeeyew" ... oh the misguided mistakes of an immature nose :o). I recently rediscovered this gem, and I am happy to report that it is JUST WONDERFUL ... still!! The best thing about this fragrance is the superbly blended Vanilla, Amber and Sandalwood base lifted by the Aldehydes up top and just the smallest hint of skank from the Civet. I'm sure the florals and fruits enhance the overall beauty of Must ... but they are such soft players as to be hardly there at all. Definitely not a "hip" frag but alarmingly unisex and ever so cultured! I see a few comparisons with Obsession ... comparing Must to Obsession is like comparing a thoroughbred arabian to a pack mule!! IMHO of course ;o). Smells of wealth, prestige and luxury. Finding this fragrance was a true God-send. Where I live, Must de Cartier is pretty much unheard of, in fact the name Cartier barely registers as being a fragrance house. A lot of people think that Cartier only makes jewellery. 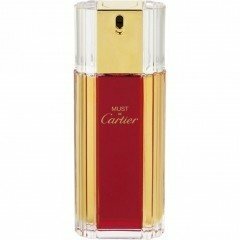 From what I have delighted in, Cartier is an amazing perfume house. Must de Cartier is my favourite so far. Classic yet extremely unique, Must de Cartier can be compared to the likes of Cacharel Eden, Gucci Rush and Rochas Byzance. As you may have gathered from the perfumes I compared it to, this fragrance is a love it or hate it. Must de Cartier is so very complex in its composition. It tends to be rather heavy and very 80's in its approach. 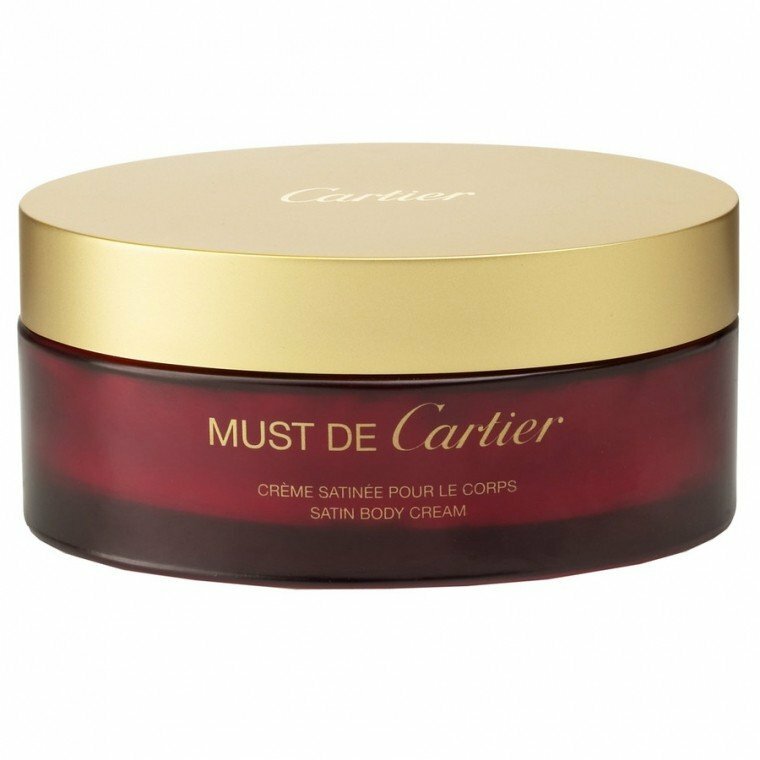 Initially, Must de Cartier goes on very oriental with an ambery spiciness mixed with exotic fruits. I usually detest pineapple in fragrances, however in Must de Cartier the pineapple note is absolutely beautiful. In the heart, this fragrance becomes rather powdery, a scent that I find resembles cosmetics. I smell vintage lipstick, perfumed face powder and inky eyeliner. A strange concoction, which is strangely appealing at the same time. I picture a dramatic woman when I smell Must de Cartier. She's the kind of lady that decks herself out in diamonds every day, wears intensely coloured clothes, high heel shoes and has perfectly manicured nails. 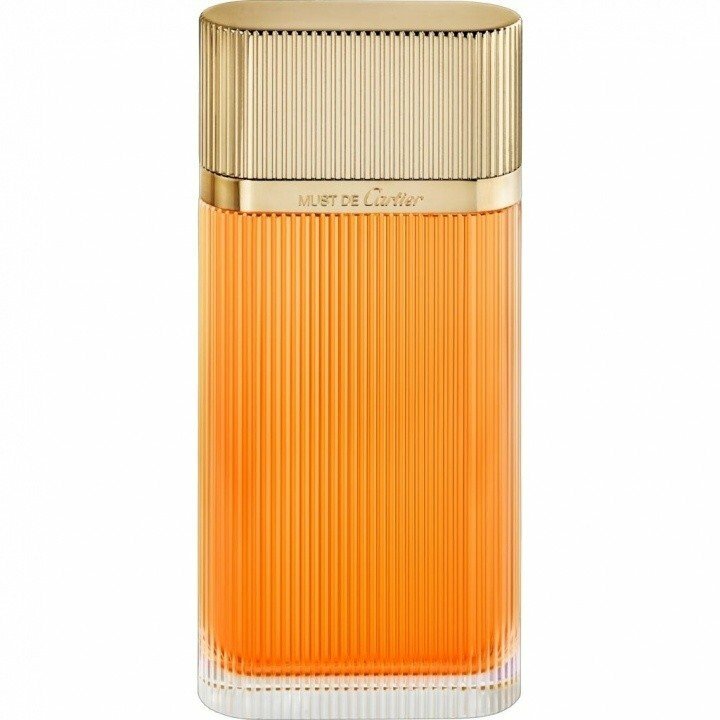 Essentially, Must de Cartier is the kind of fragrance that would suit a much older me. At the age that I am now, Must de Cartier would feel wrong, however in the next fifteen or so years, this fragrance would suit me well. This fragrance is so well balanced. The combination of spiciness, powderiness and vanillary amber is beyond words. I could praise this fragrance for at least another 1,000 words, however I wouldn't want to bore you all to tears. Getting back to the important aspects; Must de Cartier has bold sillage and commendable lasting power. All I can conclude with is my strong desire to have everyone test this fragrance, especially now seeming that it is still relatively easy to find. You may be disappointed if you leave it too long, as I fear that a discontinuation of this fragrance may be on the cards. Another no-holds-barred oriental by Cartier in the spirit of LE BAISER DU DRAGON, MUST ramps up the noir and dims the lights further by throwing both leather and civet into the mix. Deep and evocative, MUST reminds me of my night at the Melkweg in Amsterdam (fortunately I was in the company of people from my rue de vaugirard foyer whom I trusted...). Or the shock of seeing the redlight district for the very first time. MUST is the very definition of NOIR: dark, seamy, urban (Humphrey Bogart MUST be nearby...)--a bit like NYC: the city that never sleeps and, let us be frank, often stinks. No, MUST is not your vanilla-sugar-sprinkled-cupcake oriental. Legend has it that Napoleon used to ask Josephine not to bathe for two weeks at a time. My hunch is that he would have liked MUST very much. When I held my MUST-annointed wrist to my sleeping cat's nose, his nostrils began to flare, and then he licked his lips. Need I say more? tonka bean amber sweetens the base and dries with vanilla.